* Lime In The Coconut: Knock knock. Who's there? Orange. Orange who? Knock knock. Who's there? Orange. Orange who? Orange ya glad it's friday? cause I like the rug. that's just how my week has been.yeeesch. Very clever - happy orange Friday, xv. i love the top shots! very mod! is it rainy and crappy in vero today too? Love that green room best! The art over the bed is really neat. I want to take a nap in that bed, which I want to be sitting in that house. hehe. I love Orange; I didn't used to but LOVE IT now! Happy Friday! 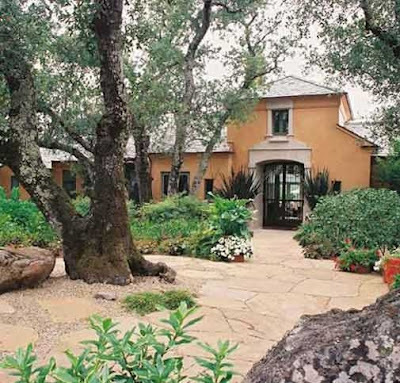 I'm with you on the orange, although I prefer copper/terra cotta shades, but they add so much warmth. It's been a random week for me too. Love the orange, and the green too! Thanks for sharing some great pics. I've been coveting that Williams Sonoma Home bedding. Thanks for all the inspiring posts. Maybe that should be my tagline. Grazie for the nice compliments - I'm honored to be included in your faves! I'm a complete newbie to the blog world. Your blog was one of the first that I landed on and has been such an inspiration - that I thought I would give it a whirl. Great post! I love a touch of orange--so warm and unexpected. I don't mind that it's random. LOVE THE PICTURES! Especially the one from WSHome with the rug! Oy vey! Happy Friday! Those picture have made me feel all summery now - thankyou! Random glimpses of loveliness are always good! When we have snow days, my imagination goes wild. Changes being made to the living room today. An update post soon!! 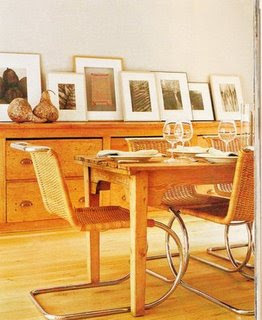 I love the kitchen table. What a great way to start the weekend! love the cheerful pics!! enjoy the weekend!! I've got a crush on orange right now :) And the green is gorgeous~ Hope you're weekend is better! You always make me grin when I'm over here. "Orange ya glad it's Friday?" Yes. Yes, I am! delicious, warm and lovely....wonderful images !!! 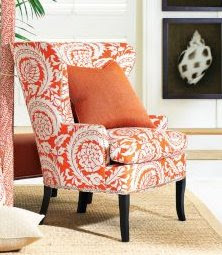 Love the WS home chair...I have only recently discovered my affection for orange! 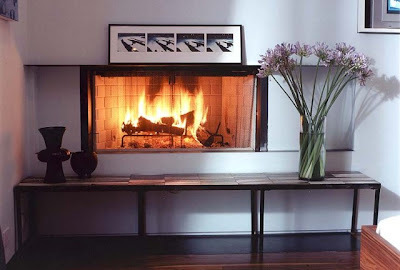 Thanks for stopping by and commenting...love your blog! thanks, L in the C, thanks. I love orange for just about anything! I didn't like it when I was growing up because my mom's kitchen was orange!! Very 70s! I am glad it's Friday. Oooo I'm hooked on that rug too - Love it! 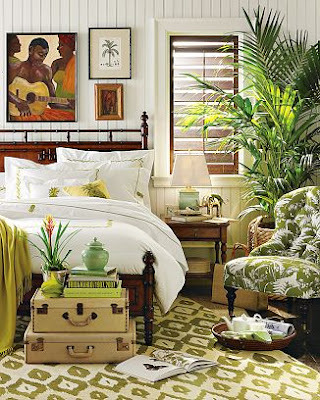 That last room, the explosion of green! Fabulous. I love the house...It needs a pet...If you want to share yours e-mail it to me and I will post it on my page...My owner loves looking at your blog!!! LOL Great inspiration photos, Linda. I like that green rug, too. LOVE the orange....Orange-ya glad I said that!??! That green rug is wonderful too.....I WANT IT! Thanks for your randomness today....I enjoyed it! 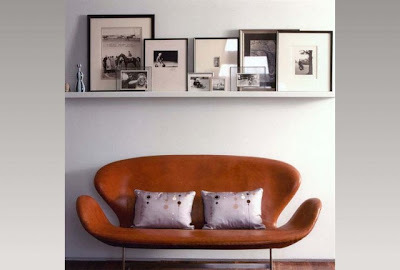 I love the orange sofa and all the pictures above. 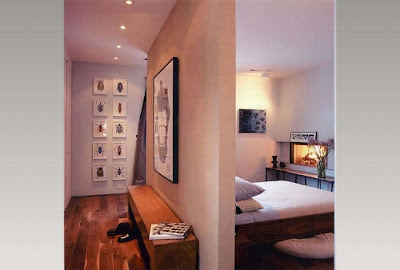 And the bedroom in the last pictures. Just my style with all the green. So beautiful. I just love your blog! It makes me feel happy. Thank you for sharing! Just browsing but WOWWW!! Double..! I love all the photo's. I think MaryAnn would love to live in this beach home! The orange chair is to DIE for.